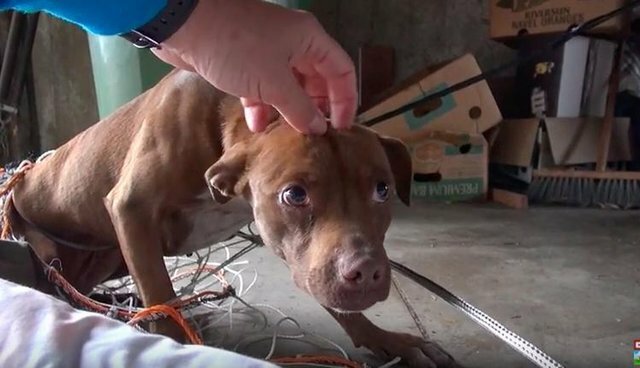 When Hope for Paws, a rescue organization in California, received a call about a homeless pit bull, they had no idea just how difficult the rescue would turn out to be. 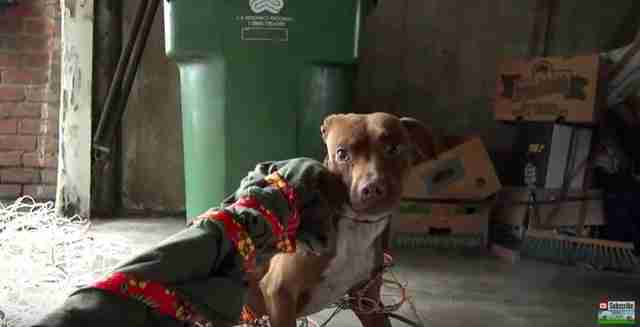 "Eden was living on the streets for a while, and wouldn't let anyone near her," Eldad Hagar, founder of Hope for Paws, told The Dodo. "If someone looked at her for more than 2 seconds, she would bolt and disappear." A local woman named Julie Maigret had spent weeks trying to gain Eden's trust so she could get her off the streets, but with no luck. 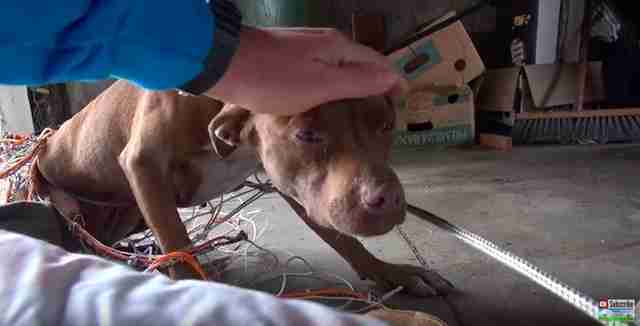 Eden was clearly terrified of people, and rescuing her would be no easy feat. On a rainy, overcast day, Hagar and his team arrived in the neighborhood where Eden had been living and found her taking shelter in a garage. They quickly tried to seal off the area, but Eden caught on and tried to make a run for it. "I was hoping to secure her inside the garage with the soccer nets and then negotiate the terms of her surrender to me using cheeseburgers, but as I was told, she just bolted," Hagar said. As Eden tried to run, she got herself tangled in the soccer nets, and this allowed the quick thinking team to finally secure her. Of course, Eden was even more terrified once she was caught, as she had absolutely no idea what was happening to her. "Eden barked at me, and as she tried to make another run for it, I slipped because the floor was wet, my assistant Lisa Arturo got tangled in the net, and we both hit the ground at the same time," Hagar said. With everyone, including Eden, now lying on the floor, the group sat quietly, hoping to gain Eden's trust and show her that they were there to help. Eden was shaking like crazy. From that point forward, Hagar and the group knew they needed to move very, very slowly in order not to spook Eden any more. "We just gave Eden some time to decompress and relax. I wanted her to see that nothing bad will happen to her, and that we are just there to help her," Hagar said. Hagar knew that trying to pet Eden would be risky because she was so scared and reactive, so he got creative. He found a broomstick in the garage, wrapped a T-shirt around it, and secured the T-shirt with a leash, creating a "fake arm." With the makeshift arm in hand, Hagar was able to reach out and touch Eden for the first time - and to everyone's surprise, she was ok with it. "Eden accepted the touch right away and never attempted to bite. After a couple of minutes of using the stick, I felt comfortable to use my hand," Hagar said. Eden may have been terrified, but when she felt that gentle touch, it seemed as if a part of her finally began to relax. As soon as she was touched, she momentarily stopped shaking. Now that Eden had calmed down a bit, the group needed to get her into a crate so they could transport her safely to the vet to get her checked out. Getting Eden into the crate stressed her out again, but once she was in, she was instantly worlds calmer. 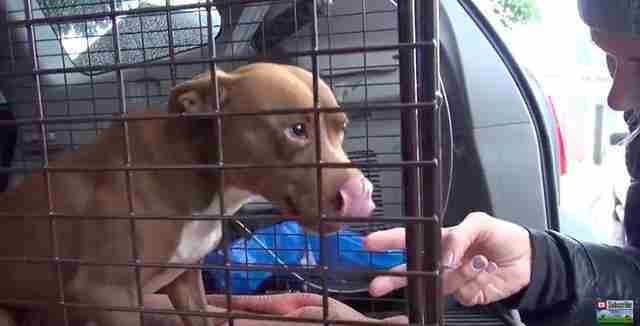 "You can actually see in her eyes the relief when we got her into the car. Her whole facial expression changed and became more relaxed," Hagar said." 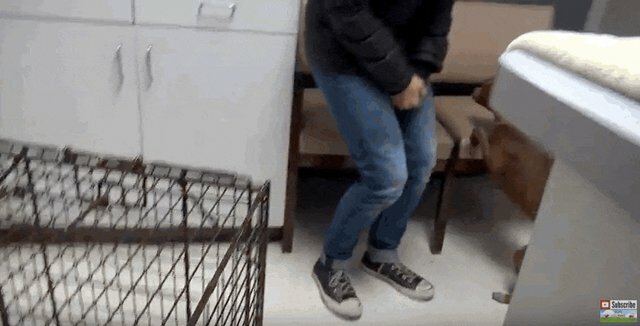 Once at the vet, Eden completely changed. 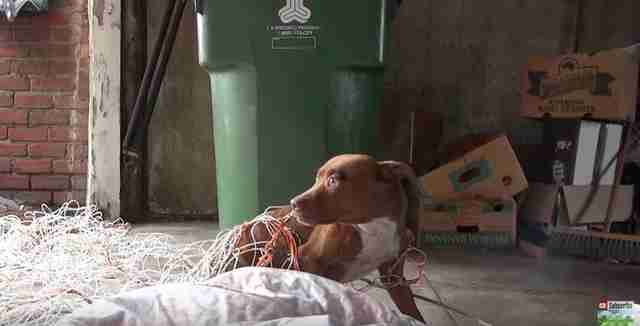 She snuggled up to her rescuers, and became the sweet dog everyone knew she secretly was. "This video shows a great example as to why people shouldn't judge any animal when it's under extreme stress," Hagar said. "So many animals are killed in shelters all over the world due to 'aggression,' where the people are confusing aggression with fear." Eden is no longer afraid and is now living with a loving foster family, and has even found herself a boyfriend there, a pup named Jack Potts. She's now a giant love bug - because she finally feels safe. If you would be interested in adopting Eden, you can contact Chews Life for more information.